I gotta say, I have to question the wisdom of putting Batter and Overtune in the same moveslot, especially since this guy doesn't seem to be built for speed anyway. I have a fair few Mechanicals I want to stone before I get to this guy, but looks like Peck - Overtune - Wind-Up might be the best moveset for it. 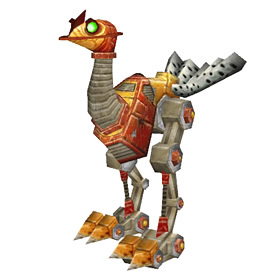 Used as a training mount for young gnomes, the Mechanopeep has none of the speed but all of the charm of its bigger brothers.